Jamie: That is a hell of a thing. Do you relive that sometimes? Or is that just gone? Monica: Oh, it never just leaves. You just relive it over and over. But as I got older, I started to accept that certain things in life I will not be able to change, and if I really, really just spend a lot of time focused on what took place, I won't be able to get over the next hurdle. Jamie: With the maturity that you've gotten in the last year, what would you say to him today if you had a chance to talk to him? Because I know you loved him, and you took care of his daughter for a while too. Are you still taking care of her? Monica: No. She's doing good. I believe Jordan is 15 and the other one is about 12. They're big girls; they live with their mother. I think the main thing I would say to him is, if today was not a good day, give tomorrow an opportunity. 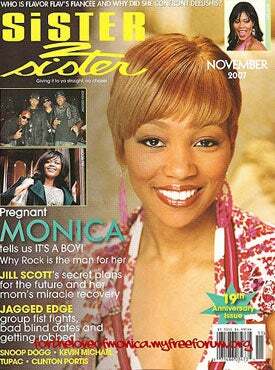 Monica's career has been so weird. A child star discovered at age 11, the 26-year old has been in the business a long time, and she's managed to have hit records peppered throughout. Just when you think she's done, she comes back with another single. Right now she's pregnant with her second child (due in January).